Avenged Sevenfold is a band from Huntington Beach, California, United States. They started out as a metalcore band, but have since moved towards hard rock. The band was formed in 1999. Avenged Sevenfold’s first album, Sounding the Seventh Trumpet, was recorded when the band members were eighteen years old. It was originally released on their first label, Good Life Recordings. After lead guitarist Synyster Gates (also known by Brian Haner Jr.) joined the band, the introductory track “To End The Rapture” was re-recorded with Gates playing, and the album was re-released on Hopeless Records. Their follow-up album, entitled Waking the Fallen, was also released on Hopeless Records and was awarded a positive rating in Rolling Stone magazine. 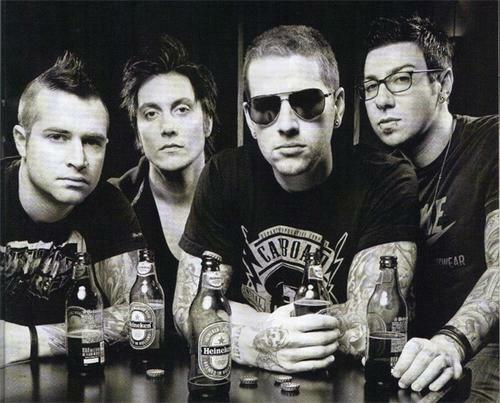 Shortly after its release, Avenged Sevenfold were signed to Warner Bros. Records. The song “Bat Country” is a reference to the book/movie Fear and Loathing in Las Vegas. The song is dedicated to the Author of the book, the late Hunter S. Thompson. Their song “Blinded In Chains” was used in the soundtrack for the video games Need for Speed: Most Wanted and Arena Football. “Bat Country” was used in the soundtracks for SSX on Tour, NHL 06 and Madden 06, following in the footsteps of “Chapter Four” which had also been on the soundtrack for NHL 2004, Madden 2004 and NASCAR Thunder 2004. The song “Beast and the Harlot” was in the soundtrack for Burnout Revenge. All the above games, not coincidentally, are produced by various divisions of Electronic Arts. “Beast and the Harlot” also appears in RedOctane’s Guitar Hero II, released in November 7, 2006. The song “Burn it Down” is featured on the October 24, 2006 release of the Saw III soundtrack. During recent tours (Spring 2006 and Ozzfest 2006 tours) Avenged Sevenfold have been performing the song “Walk”, originally by Pantera, as part of a tribute to the late Dimebag Darrell Lance Abbott. At the 2006 MTV Video Music Awards, Avenged Sevenfold received the award for best new artist. They took the award over several other artists like Angels & Airwaves and James Blunt. After canceling fall and winter 2006 tour dates, the band is planning their unnamed fourth studio album. M. Shadows has stated that it will not be a City of Evil Part 2 or Waking the Fallen Part 2, because they want to change their sound once more. They say it will be somewhat of a surprise to their fans. Some people are rejecting their new sounds, as some are embracing it. The band released their first DVD, Avenged Sevenfold : All Excess on July 17, 2007. The release date of their self-titled album was October 30, 2007; it includes the tracks Critical Acclaim and Almost Easy.